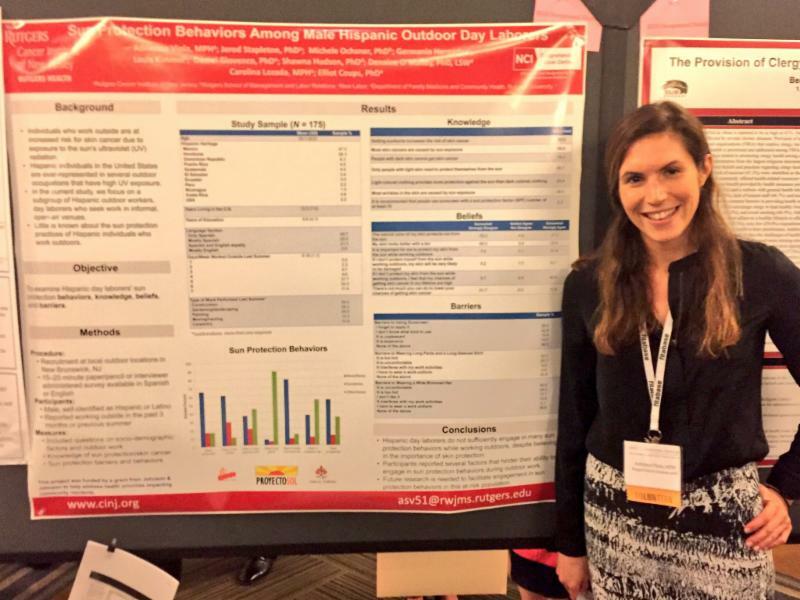 Hannah Oh, ScD, MPH, Instructor in the Department of Medicine, Division of Medical Oncology, Section of Population Science at Rutgers Robert Wood Johnson Medical School. We welcome our newest member, Dr. Hannah Oh. She comes to us from the National Cancer Institute where she held a Postdoctoral Appointment in Cancer Epidemiology. 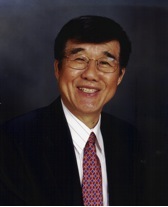 Read Dr. Oh's researcher profile. 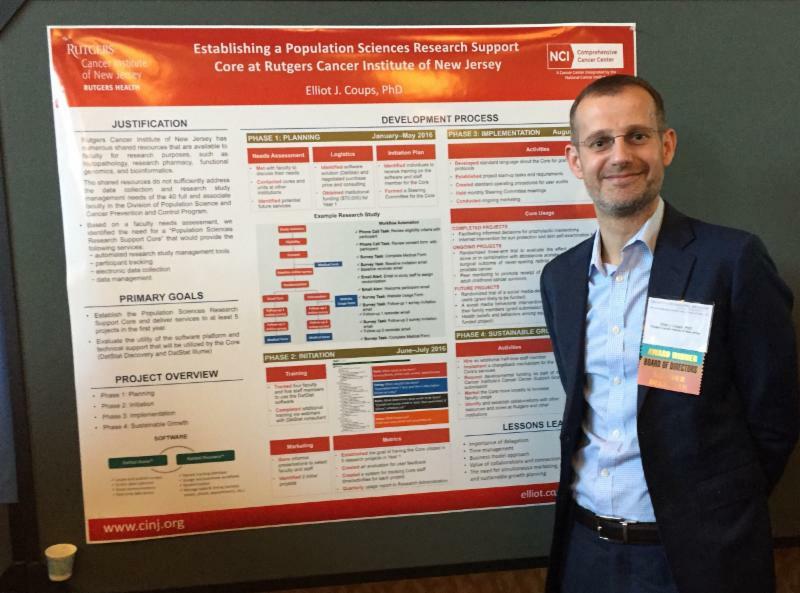 Elliot Coups, PhD, Associate Professor, Population Science, presented the following poster entitled "Establishing a Population Science Research Support Core at Rutgers Cancer Institute of New Jersey". He also presented a talk titled, "Project SOL: Testing a Sun-Safety Program for Hispanic Outdoor Day Laborers." Dr. Coups also received the Society of Behavioral Medicine’s C. Tracy Orleans Distinguished Service award. The award recognizes his completion of a three-year term serving as Member Delegate on the Society’s Board of Directors and Executive Committee. 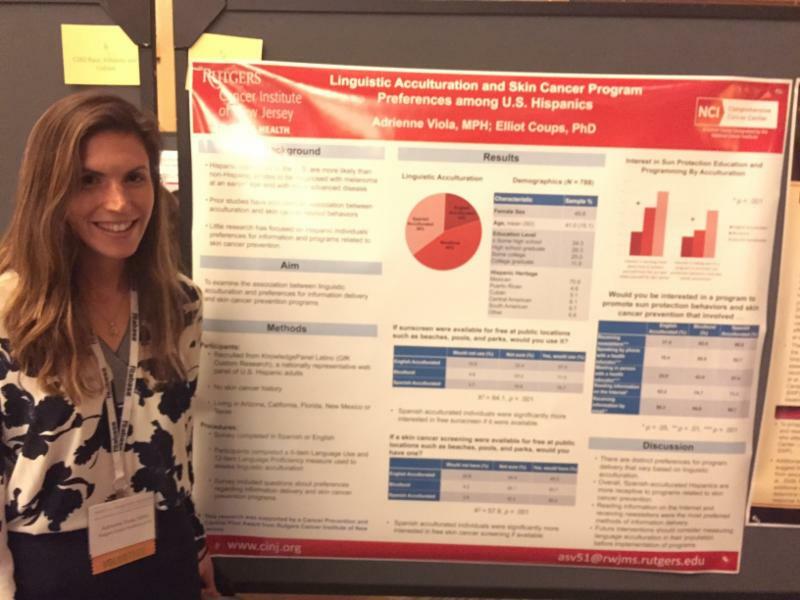 Adrienne Viola, MD/PhD graduate student, presented the following poster entitled "Linguistic Acculturation and Skin Cancer Program Preferences among U.S. Hispanics." Ms. Viola also presented the following poster entitled, "Sun Protection Behaviors among Male Hispanic Outdoor Laborers." 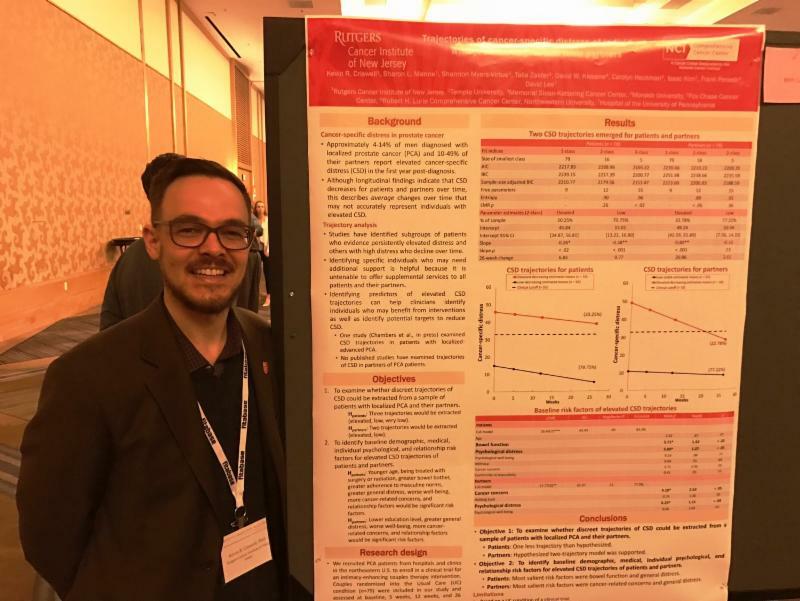 Kevin Criswell, PhD, Postdoctoral Appointee, Population Science, presented the following poster entitled, "Trajectories of cancer-specific distress of individuals with prostate cancer and their partners." 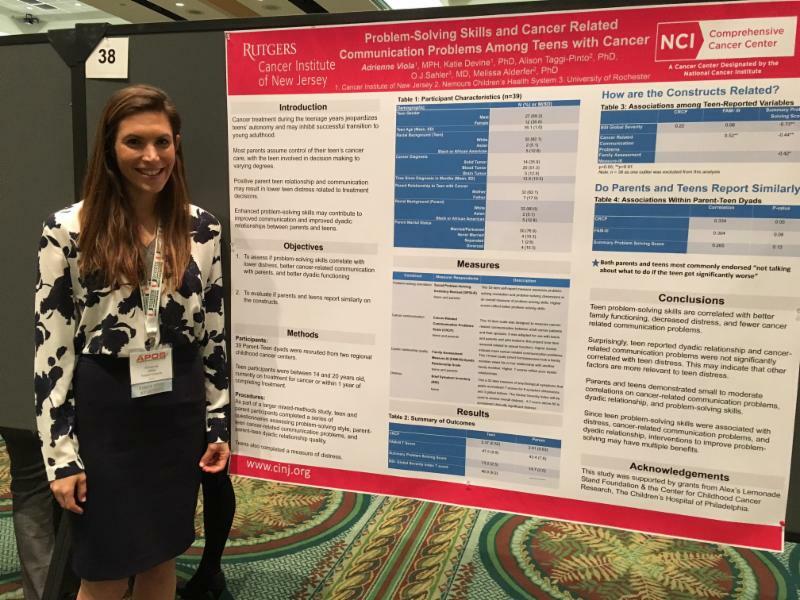 Adrienne Viola, MD/PhD graduate student, presented the following poster entitled "Problem-Solving Skills and Cancer-Related Communication Problems Among Teens with Cancer." 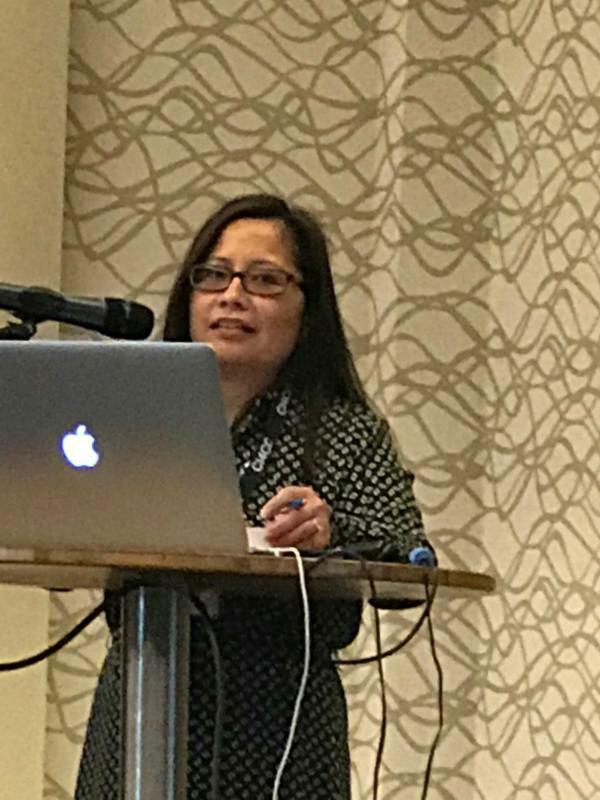 Antoinette (Nan) M. Stroup, PhD, Associate Professor, SPH, Director, NJ State Cancer Registry, was an invited moderator for the session on "US State Cancer Registries," as President-Elect of NAACCR. 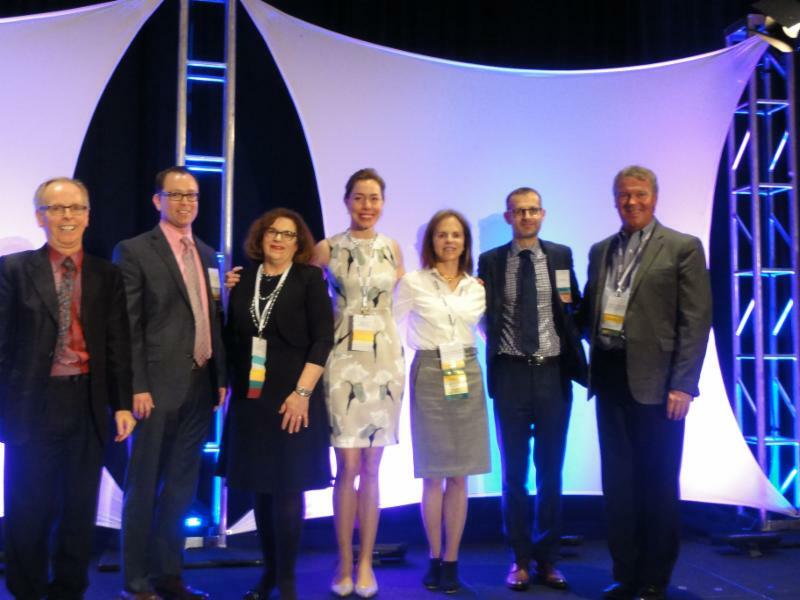 Cancer Registries were recognized as an essential partner in the advancement of cancer informatics for research. More about CI4CC. 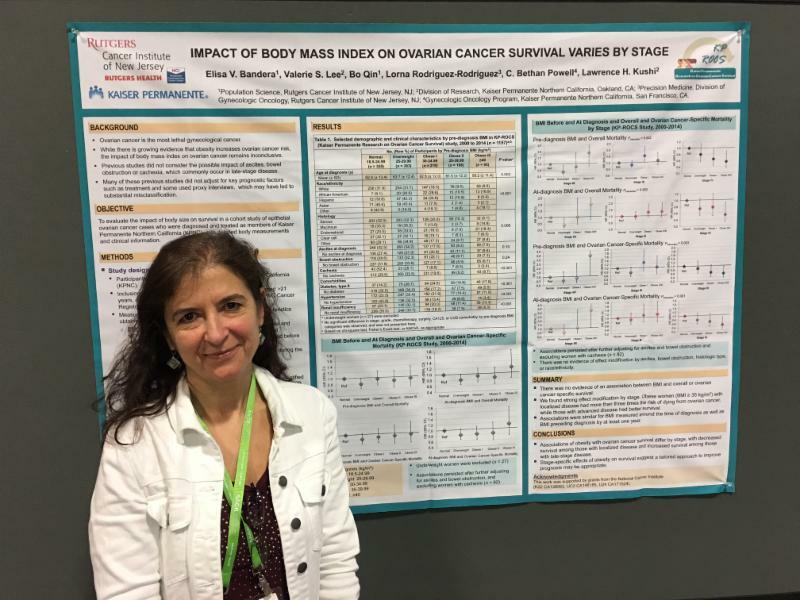 Elisa V. Bandera, MD, PhD, Professor of Medicine and Bo (Bonnie) Qin, PhD, Postdoctoral Associate, Population Science, presented the following poster entitled, "Body mass index and ovarian cancer survival varies by stage." 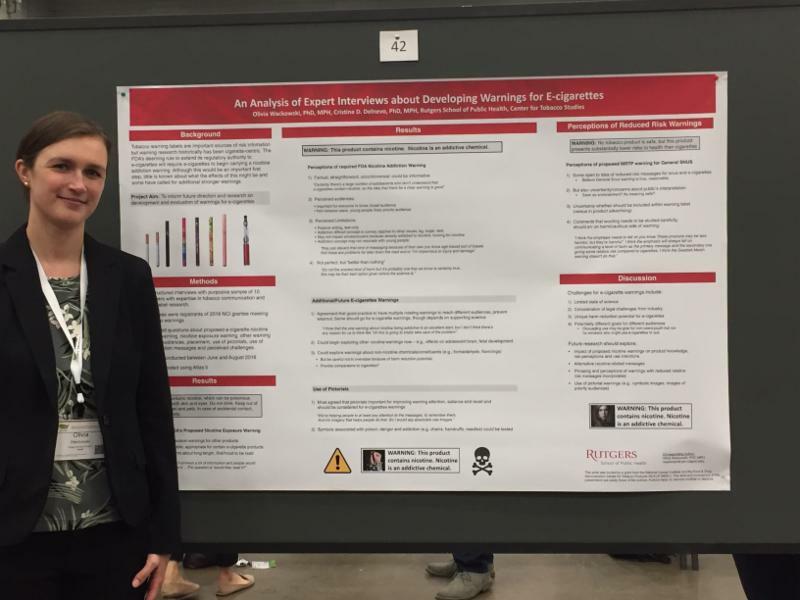 Olivia Wackowski, PhD, MPH , Assistant Professor at Rutgers School of Public Health, presented the following posters entitled, "An analysis of expert interviews about developing warnings for e-cigarettes", "Consumer beliefs about the health risks of combusted and non-combusted tobacco products. Invited presentation for Sub-Plenary Session (The Evolving Nicotine Marketplace: Implications for Tobacco Control)," and the following poster with Jane Lewis, PhD , Associate Professor and C ristine Delnevo , PhD, MPH , Professor and Chair of Health Education and Behavioral Science at Rutgers School of Public Health, entitled, "The Impact of Smokeless Tobacco Risk Information on Smokers’ Risk Perceptions and Use Intentions - a News Media Experiment." 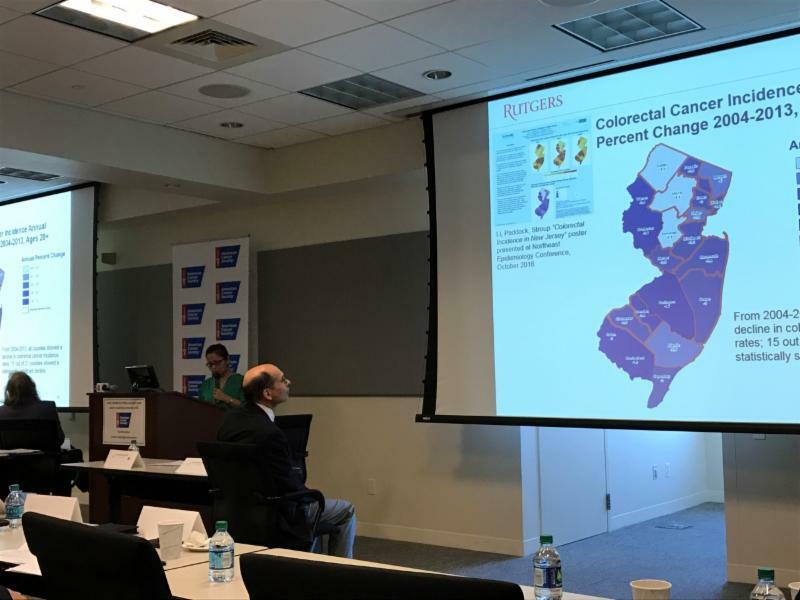 Antoinette (Nan) M. Stroup, PhD , Associate Professor, SPH, Director, NJ State Cancer Registry, presented at the CRC Stakeholder Meeting, held at Johnson & Johnson, New Brunswick. Her topic was entitled, "Is Colorectal Cancer on the Rise in New Jersey Young Adults?" 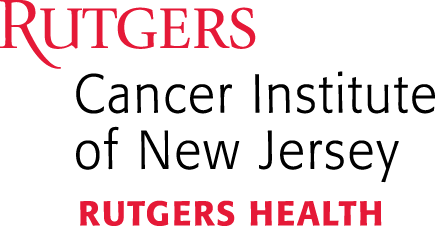 Antoinette (Nan) M. Stroup, PhD, Associate Professor, SPH, Director, NJ State Cancer Registry was recognized for her submission entitled, “Early Life SES, Birth Certificates, and Cancer in Adulthood” for the 1st annual 2017 Rutgers Celebration of Scholarship. Dr. Stroup’s work will be included online along with all the other projects in our celebration at a later date at the Rutgers University libraries. Benjamin F. Crabtree, PhD , Professor, RWJMS, Department of Family Medicine and Community Health, received the 2016 Norman H. Edelman Clinical Science Mentoring Award. Dr. Crabtree was presented the award at the General Faculty Meeting, March 2017 by Dean, Sherine E. Gabriel, MD, MSc. 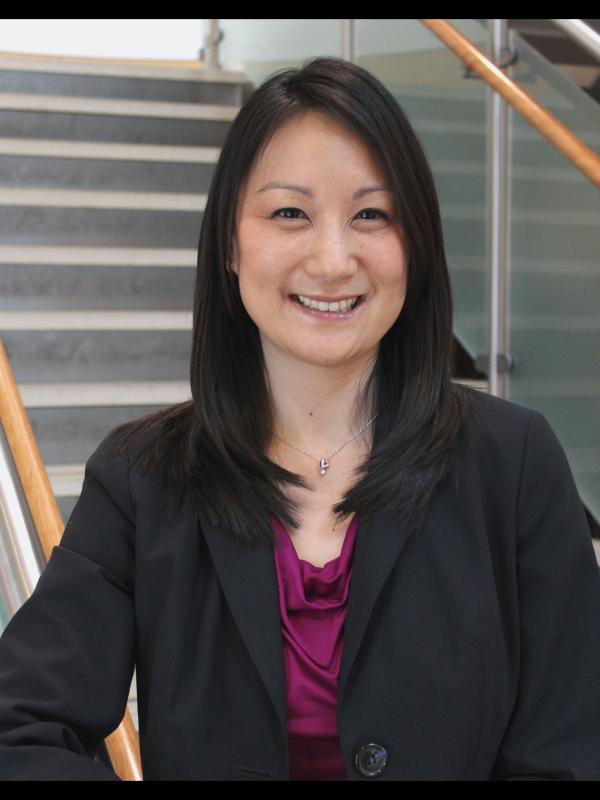 Jennifer Tsui, PhD , Assistant Professor, Population Science, was awarded a grant entitled, "Health Care Delivery and Care Transitions for Underserved Cancer Patients" by the American Cancer Society. Term 2017 - 2022, $729,000. Elliot Coups, PhD, Associate Professor, Population Science, was awarded a grant entitled, "An Online Intervention for Skin Self-Examination among Individuals at Increased Risk for Melanoma" by The Harry J. Lloyd Charitable Trust. Term: 2017 - 2019, $200,000. Co-Investigators include David Rotter, PhD, CINJ, Michael Marchetti, MD, Memorial Sloan Kettering Cancer Center, and Lee Ritterband, PhD, University of Virginia. Huailong Chang, PhD, Postdoctoral Appointee, Population Science, was notified of the state's intent to award his grant entitled, “Metformin and RET in Pancreatic Cancer Metastasis” by the NJ Department of Health - New Jersey Commission on Cancer Research Post-Doctoral Fellowship. Term: 2017 - 2018, $100,000. Please join us at the next CPC Program meeting on Monday, May 15, 2017, noon, CINJ, Auditorium A. Presenter will be Chung S. Yang, PhD, Director, Center for Cancer Prevention Research, Ernest Mario School of Pharmacy. Title "Does vitamin E prevent or promote cancer?" Refreshments provided. The 2017 Annual Retreat will be held Thursday, May 25, 2017. Keynote speaker will be Lewis C. Cantley, PhD , Professor, Cancer Biology in Medicine, Weill Cornell Medicine. Community Health and Health Systems Series will take place on Tuesday, June 6, 2017 at 1:30 pm at the Institute for Health, room 120A. Guest speaker will be J ennifer Tsui, PhD , MPH, Assistant Professor of Medicine, Population Science. Please join Adrienne Viola, MD/PhD graduate student, who will lead our next CPC Journal Club on Tuesday, July 11th at 4 pm. The Journal Club meets every second Tuesday of every other month. Meeting location is located at RCINJ, 5th floor, room 5546. For further details, please contact Sarah Scharf at (732) 235-6472. The Population Science Research Shared Resource supports the development and implementation of research through comprehensive study project management tools, participant tracking, electronic data collection, and data management. Please contact Dr. Elliot Coups ( coupsej@cinj.rutgers.edu ) or Carolina Lozada ( lozadaci@cinj.rutgers.edu ) to set up a meeting to discuss how we can provide support for your research efforts. News to share? We invite you to send your news and updates to be considered for publication in an upcoming issue of The CPC Newsletter. Please note: All news items must adhere to Rutgers editorial guidelines and Associated Press style; accepted submissions may be edited in accordance with those guidelines. If you also have an accompanying photo you would like to be considered, please submit a high-resolution, print-quality image that is 300 dpi. Email all submissions to Sarah Scharf.